A S mart Home is really just a collection of technical home automation concepts that are implemented by your installer and integrated together to meet certain goals and expectations of you, the client. A good job entails providing the highest quality of integration between the chosen 'Home Automation concepts' using products that are, by themselves as stand-alone products, well supported in the market and can be enhanced by cross-linking with other Smart Home systems. In this article is a description of many of the Smart Home Automation concepts worth considering. How they interract in your new Smart Home will define whether you have a premium installation or just a collection of orphaned islands of functionality. You can end up with a home that is almost intuitive to your needs, but realise that the more you want it customised to your personal needs, the higher the cost of integration. The control of lighting is the usual first port of call for any home automtion system. Being able to dim lights is just the beginning. 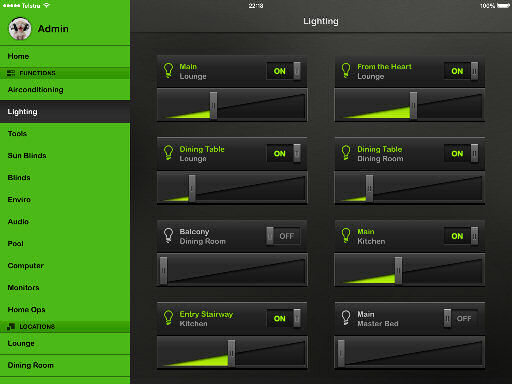 Imagine you lighting setting moods in different parts of your house at different times of the day, automatically adding light when it becomes dark at the end of the day or if it is cloudy and saving you money by only providing as much light as you actually need for a job rather than being on or off. Add to that relagating to annals of history the nightly march from one end of the house to the other turning off the lights as you go. One button next to your bed handles that in a Smart Home. Controlling heat entering a room is a great way to keep your house cool in summer but warm in winter. External 'see through' sun-blinds are very effective and save the power required to keep your house interior cool in summer. In Winter, External sun blinds, louvres or shutters can retract early to gain the most use of winter sunlight entering your rooms to keep them warm. In Summer, the reverse happens with the sun blinds keeping the UV and infrared rays out of your house to keep it cool. The savings in heating and cooling your rooms can be large. Interior blinds also stop heat entering rooms during the day but are also useful in stopping internal heat being lost through large glass windows during winter and at night. There are many areas of home entertainment that can be enhanced through Smart Home integration. Media storage and distribution, multi-zone audio and video systems, personal music device integration, broadband Internet access and game system integration are just a few of the standard techniques implemented. For convenience value, The Smart Home of today tends to use your personal devices to double up as remote controls for your home. 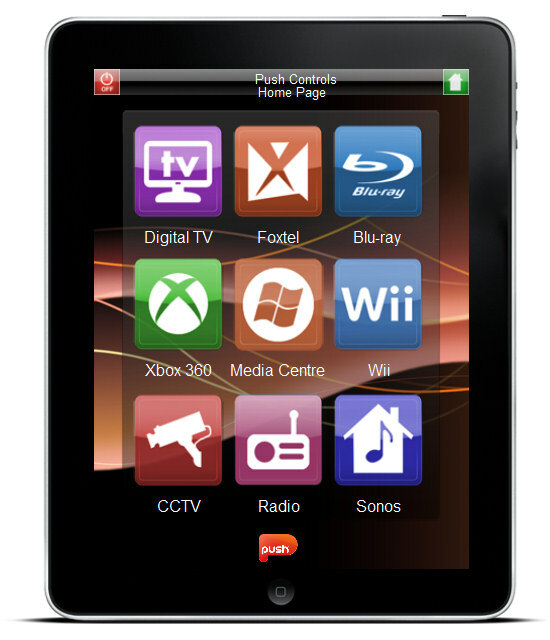 Applicaations abound for iPhone, iPad, Android Phones and tablets that allow them to act as remote controllers of your home environment. Imagine being able to control lighting, entertainment, heating or cooling, and security and access control all from the device that is in your pocket. Whilst dedicated remote devices are also available to enhance your ability to control your Smart Home, increasingly people are becoming more confortable using just one device that they are very familiar with. Remote control of all your home systems is the pinnacle of lifestyle and convenience that makes the investment worthwhile. Check the security of your house, adjust the pool systems run time or let a cleaner in for the morning, all from your beach chair in Bali. Turn your air-conditioning and lighting on in advance if you are coming home unexpectedly. You have the control in your hands. The control of heating and cooling within the smart house is one of the key areas where money can be saved on power bills through more extensive automation control. Sub-Segmentation and occupancy control allows only the area needed to be heated or cooled and start and stop times can be controlled based on thermo requirements as noted by temperature sensors and areas where you and your family are stay cool while other areas fall back to a higher temperature making considerable energy savings. 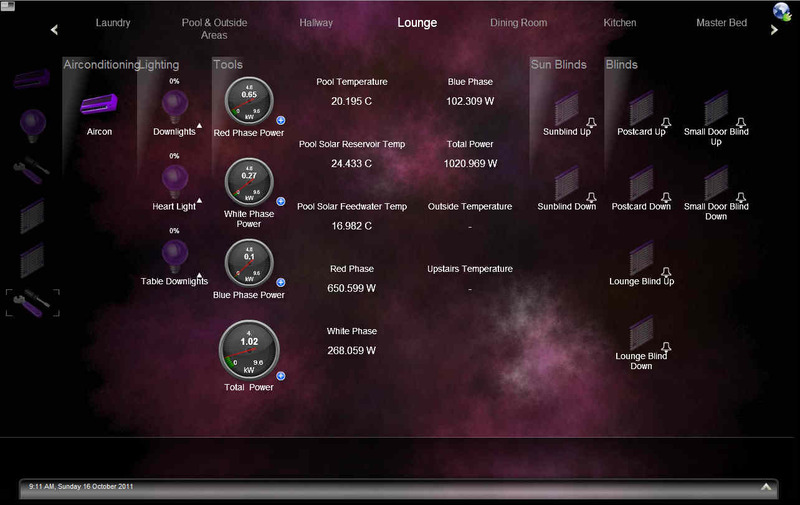 With an automated Smart Home you have the ability to keep track of the energy use of all components drawing power. 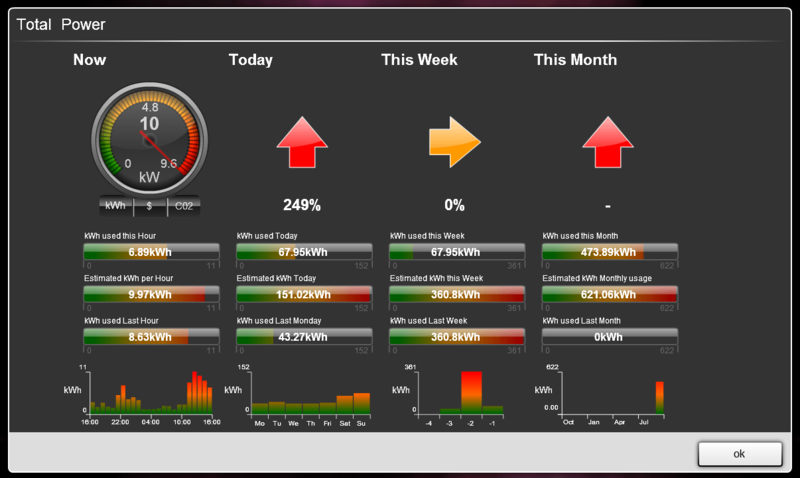 This allows you to do things like grouping energy use by arbitary area such as Pool, Lighting, Heating etc Imagine being able to drill down on your usage by time and adjust or move usage to a different time to reduce your power consumption for example from peak electricity tariff period to shoulder tariff. 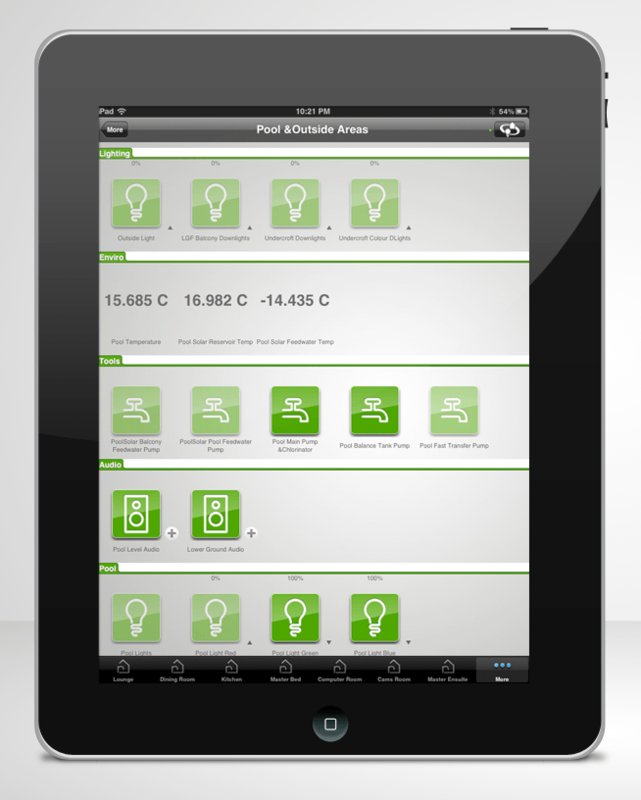 You can even graph usage on your iPhone, iPad, Android phone / tablet or cTouch Touch screens. When you can see how much power you are using, it is amazing how much you can reduce for example by just by dimming a few lights or by moving the pool pump run time to a different tariff period. When everything is automated, lights and environment can even follow you automatically around your house and un-occupied areas can be set to reduce energy use through air-conditioning or heating segmentation and lighting being automatic. 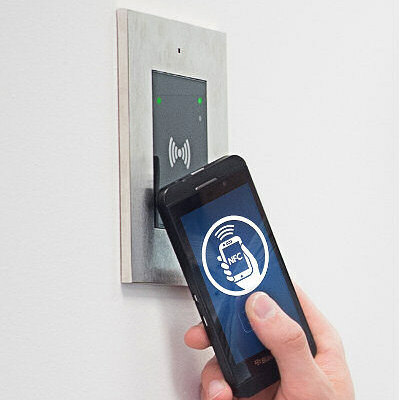 Access Control is controlling who enters your home using an entry system that can use Smart Card readers, radio key tags, Near Field Communications NFC sensing, fingerprint recognition or even facial recognition to ensure a person should have access. Some systems use the existing telephones in your home, or a video phone or touch screen so you can see and talk to callers at your door or gate. You can even have callers call and be displayed on your iPhone or Android phone when you are away from your home, making the caller think you are inside your home. A stand-alone security system for your home is a good investment, but link and integrate it with your Smart Home automation system and you will multiply its value. Security sensors can be used in a dual role as occupancy sensors, keeping your home automation system informed of your whereabouts allowing the home to make adjustments to the environment based on these input. For instance, you could have lights and air-conditioning switch off in areas of your house that are not occupied making your house more energy efficient. You could have lighting come on in the event of a panic alarm or fire alarm. With higher levels of integration with the access control system and a surveillance system, you can allow entry to house for contractors disabling certain house alarm segments/areas and watch their work, all while away on holidays half a world away. This is the power of intergration. The pool of the standard house is one of the most energy inefficent areas. With the high cost of electricity, many houses have a dumb timer that switches the large pool pump on for large swathes of time year round. A Smart Home Automation system can use a more logical configuration, reducing the amount of run time during winter months and increasing it again for summer. It can even monitor pool temperature and intelligently control heating systems to give you swimming on weekends in Autumn, whilst saving power or gas the rest of the time. A standard sized pool uses 10 kilowatt hours of energy per day but this can be significantly reduced at certain times fo the year, and the costs of energy greatly reduced through intelligent control and time shifting to lower electricity tariff periods. Why stop inside the house? 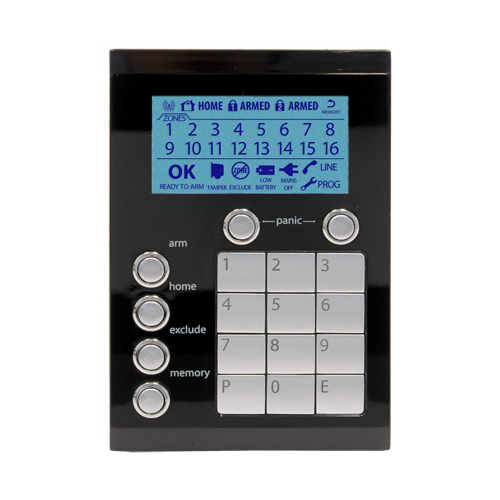 Control the garage door, car access gate, front gate, extending pergola, ponds, water features through the same automation system giving strict scheduled control of these features and full remote control. Why get up to adjust the pergola when it is too sunny during your barbeque lunch when you can just push a button on your phone? All your guests will want one too! Saving water is less of a concern than it was a year or so ago but having a watering system can be a very water efficient concept and saves you lots of time manually watering your garden. Look like a green thumb with little or no required effort on your part. Once again home automation enhancing your lifestlye by doing the work for you, freeing your time up for more important things like spending time with your family and friends. For further concepts that are specific to certain situations you may find yourself in, try the links below. If you are renovating, 'Extensive Renovations' implys the removal of most interior linings, making possible re-cabling for Smart Home features. 'for Renovators' is tailored towards projects minimising impact to the existing linings, so leans toward wireless Smart Home technologies and concepts.